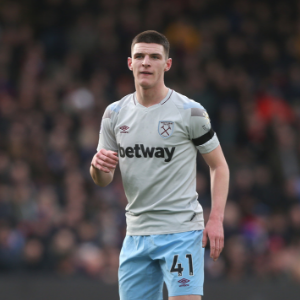 London - West Ham manager Manuel Pellegrini admitted England international Declan Rice could be lured away from the London club this summer should a "good deal" come along. Rice, 20, has been linked with Manchester City and Manchester United after a stellar season that saw him earn his first two England caps in the past week after switching international allegiance from the Republic of Ireland. However, he extended his contract with The Hammers until 2024 in December and former City boss Pellegrini believes it will take a big transfer fee for Rice to be sold. "If it is a good deal for the club and the player and improves his career, then we can do it. But I know nothing about that yet," said the Chilean on Thursday. Pellegrini was not surprised by Rice's composure on the international stage, which saw him handed his first England start in Monday's 5-1 hammering of Montenegro but insists there is still plenty of improvement to come in the midfielder's game. "I have said before that he is a young player, just 20 years old, but his mind is that of an adult player," he added. "He never feels pressure playing here or with the national squad. I was absolutely sure his level of performance would be exactly the same. He is a top, top player. "He knows he must improve, that is why he is always listening and learning so, as a player, the way he plays more games and better games he will continue improving."